On his new EP, Where Eagles Fly, JD Weaver sounds rugged and brooding. Between raw, yearning vocals and finger-picked melodies, he combines the grit of a mountain man with the wistfulness of a traveling folk artist. At once rambling and dynamic, the three tracks—Native Man, Eagle Song, and Tiger Tiger—conjure up the image of a dream-dazed wanderer, the kind of restless twenty-something more comfortable spending nights on a Greyhound bus than in his own bed. In person, Jason Daniel Weaver is round and ruddy-faced, a mop of blond hair masking his forehead. He speaks quickly and earnestly with a thick North English accent as we Skype from his bedroom in Cheshire, England. Despite the folksy wanderlust in his music, in reality Weaver rarely leaves his home. “This is it—these four walls and my laptop and my guitars are all I pretty much do at the moment,” he told me. At age 9, Weaver was diagnosed with Duchenne muscular dystrophy, or DMD, a debilitating genetic disorder that causes the progressive shrinking of muscle tissue throughout the body. Over the past ten years the disease has eaten its way through his lower half, rendering his legs useless and forcing him into an electric wheelchair. In several years, he will lose mobility in his arms, as well. Eventually, the condition will reach his heart. “I try not to think about it,” he said. The average life expectancy for individuals with DMD is 27 years. After recording a handful of lo-fi demo tapes in his bedroom, Weaver decided to approach labels with his work. Yet their response disappointed him. “They just saw a disabled musician and said, ‘how are we going to sell this to an audience?’” he explained . Weaver says he was told his disability made him unmarketable to mainstream listeners—an idea that infuriated him. 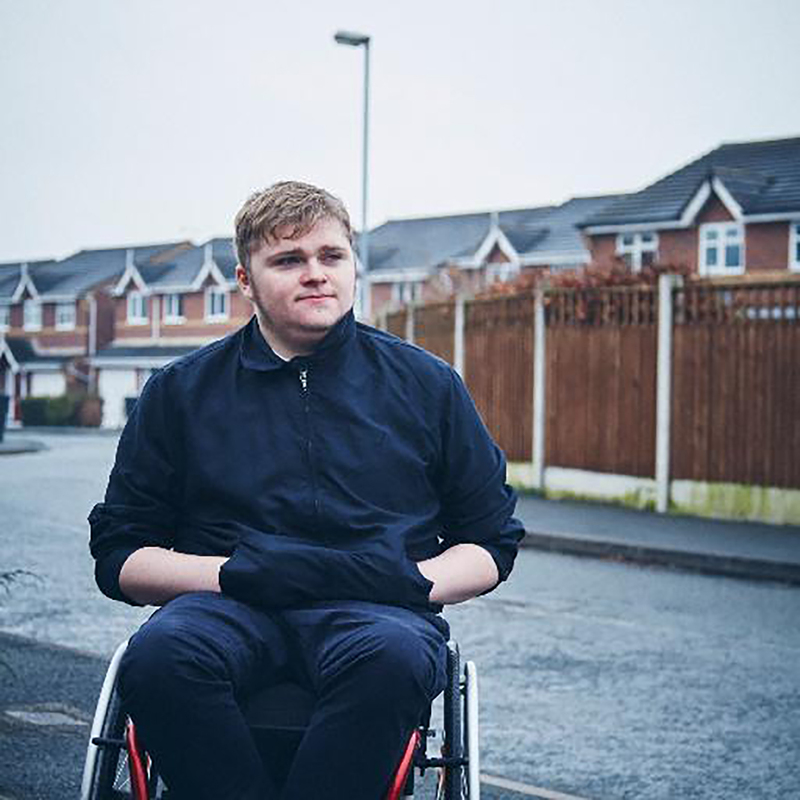 “I thought, if you’re just worried about making money off of someone with a disability, then I think you might want to remind yourself what you actually want to achieve in music. Because for me, music is about being meaningful,” he said. Indeed, the music industry is not friendly to musicians with disabilities. Though Weaver estimates that, statistically speaking there are between 50,000 and 100,000 disabled musicians in the UK, he knows of only one signed artist who is not able-bodied—a singer with a prosthetic leg who he feels he is not representative of the broader community. “I don’t want to offend people, but it’s a lot easier gigging when you’ve got a prosthetic leg than when you’re in a wheelchair, and you’ve got all this equipment,” he said. On the EP, this desperation comes across as passion, lending the tracks an up-tempo intensity that sets Weaver apart from mellower, more traditional singer songwriters. Over alt-country hooks, he sings about ambition and empathy and alienation, attacking the sources of his frustration—his body, a closed-minded society—with frantic strumming and earnest lyrics. Since the EP’s release, Weaver has earned local radio play and a small but loyal following on Soundcloud. He maintains that he is not out for fame, and that the limited scope of his success thus far doesn’t bother him. “I don’t think I’m ever really going to get big,” he told me. “If one person listens to my music, I feel like I’ve sold a gold disk.” Even so, he is deeply frustrated by the industry’s dismissal of his talent. “It’s not fair that I have twice the amount of work as someone my age who doesn’t have a disability, yet because of my disability, labels and managers won’t give me a chance,” he said.